As the winner of Shropshire’s BCA for Best Nursery in 2016, we are thrilled to announce that we have been nominated for 2017 awards. 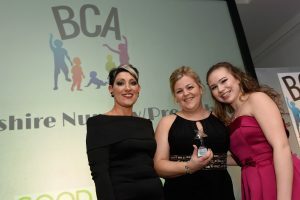 The ‘Businesses for Children Awards’ honour the Shropshire businesses that educate, support or provide activities for children and young people in the county. We’re once again looking forward to attending the awards dinner next March! 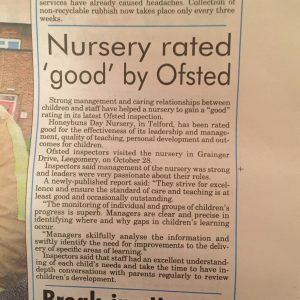 Honeybuns Telford are very proud to announce the outcome of their recent Ofsted inspection, which took place on 28th October 2016. They were given an overall judgement of ‘Good’ including mentions of ‘Outstanding’ aspects of provision also. It goes without saying that we are extremely proud of the team at Telford! We would like to take this opportunity to say thank you to the parents for their continued support and to the many parents who took the time to speak to Ofsted on the day of the inspection. This weekend and next week, Honeybuns Nursery’s are proudly supporting Children in Need, with lots of fun things for the children and adults alike! Saturday 12th November – Norton Canes Charity Car Wash. Come along and have your car washed between 10-2pm. £3.00 per car, all proceeds donated to Children in Need. Sponsored ‘Find Pudseys Spots’ – Throughout the week the children will go on a Pudsey Hunt around the nursery where they will be able to find Pudseys hidden spots. If you do not have a sponsor form please ask at the nursery office. Pudsey Cakes and Biscuits will be on sale throughout the week. The children will be busy baking to help raise money. The staff will be shaking their donation buckets in nursery whilst attempting to skip and hula hoop continuously throughout the day. Please help us to raise as much money as possible for Children in Need by returning your sponsor forms and money to nursery next week or by placing your donation into one of our Children in Need collection buckets.